Penguin belongs to the class of sloops built during the comparatively brief period of composite construction in the Royal Navy, Penguin having an iron frame sheathed with teak and copper. They were slow, but in seaworthiness, under all possible conditions and in ease of handling and durability, they had no superiors. Sister ships to Penguin laid down in 1875 were Wild Swan, Osprey, Pelican and Cormorant. This group were followed by nine more vessels of the same type named Kingfisher, Gannet, Espiegle, Dragon, Doterel, Phoenix, Mutine, Miranda and Pegasus. Like all the single screw composite sloops built for the Royal Navy, they were barque rigged, carrying a total sail area of 14,800 square feet excluding stunsails. They were the largest vessels launched after 1870 to carry wooden instead of iron lower masts, each mast made from a single fir tree drawn from those growing in the New Forest, specially planted centuries before to meet the needs of the King's ships. HMAS Penguin was commissioned into the Royal Australian Navy on 1 July 1913. This was to be her 6th full commission over a period of 17 years. On commissioning, Penguin was sent to the Pacific where she spent four years before returning home in the latter half of 1881 to pay off at Plymouth. She was put into dockyard hands for replacement of her engines which had been a continuous source of trouble. At the same time her 64 pounder stern chase gun was replaced by two 5-inch 38 cwt breech load guns mounted on the poop. A long period in the fleet reserve followed and she did not go to sea again until she recommissioned for service on the East Indies Station in 1886. During her second commission she took part in the suppression of the slave trade on the East African coast and in 1888 she also took part in the blockade of Zanzibar. Penguin returned to England in 1889. A different kind of service now awaited Penguin, which was destined to last for six full commissions over a period of seventeen years. In the 19th century, the waters of Australasia and the Western Pacific were incompletely charted and large stretches of coast in that quarter of the globe remained hazardous for the navigator. The Admiralty, as the body responsible for hydrography, were anxious to remedy this state of affairs and at this period were considering vessels suitable for the purpose. The composite sloops now obsolete as war vessels were ideal, combining as they did, good sea keeping qualities, with ease in handling, a shallow draught and the ability to conserve fuel by the use of her sails. Accordingly Penguin was selected for conversion to a Survey Ship. All her guns were removed except for a pair of broadside 64 pounders which were left on board as an insurance against attack by natives. The spaces left vacant by the removal of her two 7-inch guns were used for erecting deckhouses as cartography and instrument rooms, and ship's boats were increased to nine in number including two steam cutters. Conversion work was completed in December 1889 and in January 1890 she commissioned and sailed for Australia to begin her long task of filling up the many blanks on the charts. In 1895, working in the Tonga Trough, she sounded to a depth of 4,900 fathoms without touching bottom, beating the existing record of 4,575 fathoms established by HMS Challenger in 1875. The survey of the Pacific Cable route was also part of Penguin's duty and she is reputed, during this period of her service, to have remained under way for eleven months. Penguin carried out surveys of the treacherous Great Barrier Reef off the Australian coast in 1905 and 1906, correcting much faulty earlier work and continuing the trigonometrical survey of the Queensland coast where Commander EP Bedwell in HMS Llewellyn had left off in 1879. In January 1907 Penguin arrived at Sydney from Queensland waters for paying off which took place on 31 March 1907, bringing a seagoing career of more than thirty years to a close. As a survey ship she had completed six full commissions, receiving new officers and men in 1893, 1896, 1899, 1902 and 1905. Her duties were taken over by HMS Fantome, commanded for several years by Captain FC Pasco RN, grandson of Crawford Pasco who had served in HMS Beagle under John Lort Stokes and great grandson of the Lieutenant Pasco responsible for hoisting Nelson's famous signal at Trafalgar. 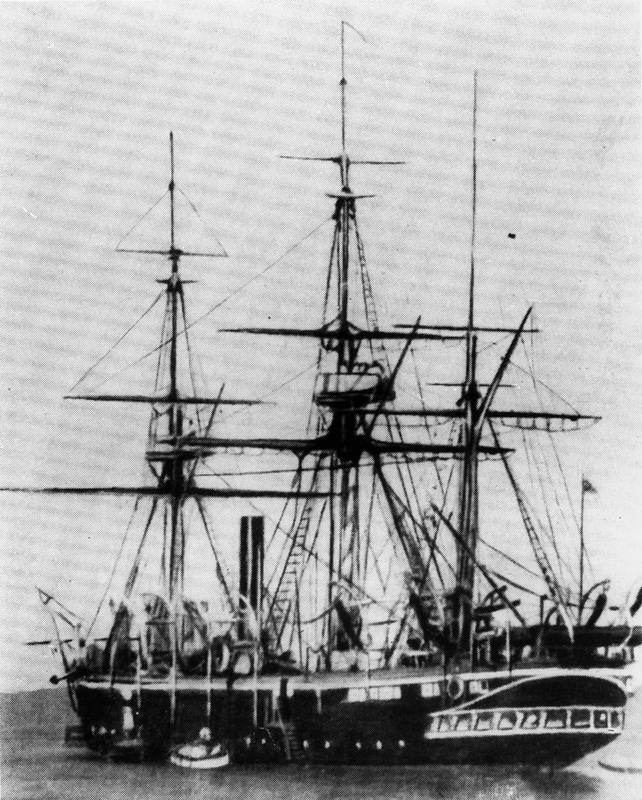 Beagle had served as a survey ship in Australian waters between 1837 and 1843. On 17 February 1908 expenditure of £670 was approved to convert Penguin to a Depot Receiving Ship for use at Garden Island in Sydney. She recommissioned in the Royal Navy on 1 January 1909. In 1913 the Admiralty relinquished control of Garden Island and its naval establishments to the Australian Commonwealth and sold Penguin as part of the effects for the sum of £2000. She was recommissioned into the Royal Australian Navy as HMAS Penguin on 1 July 1913 and remained as a Depot Ship berthed at Garden Island until 1 January 1923 when she paid off for disposal. 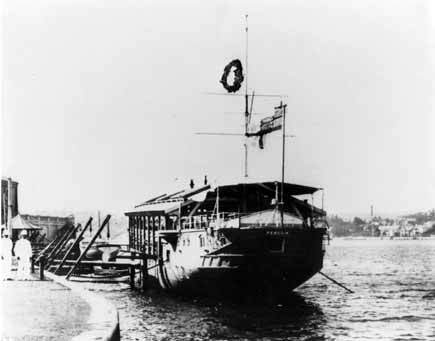 On 9 May 1923 she was towed to Cockatoo Island and handed over to the Commonwealth Shipbuilding Board. She was transferred to the Commonwealth Shipping Board in August 1924 for final disposal. 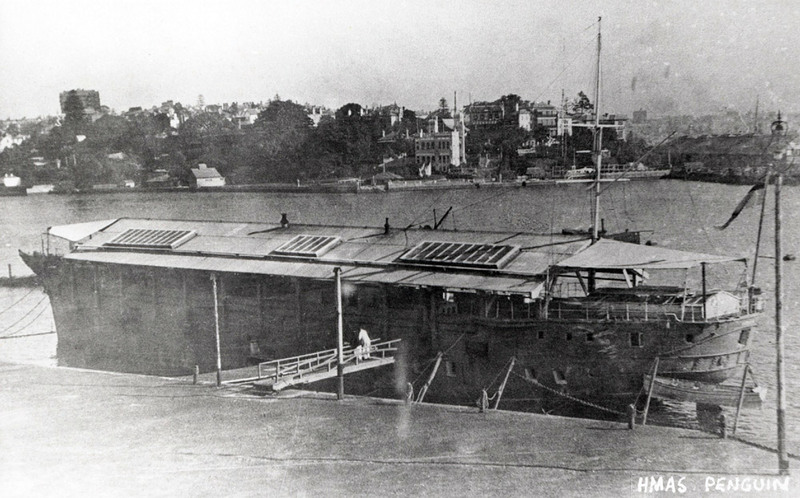 Breaking up was completed at Cockatoo Island in April 1925 and the hull sold to Mr HP Stacey of Sydney.